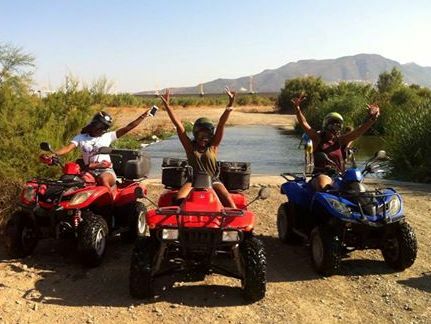 Guided tour on Quad during 2 hours along the Guadalhorce River! 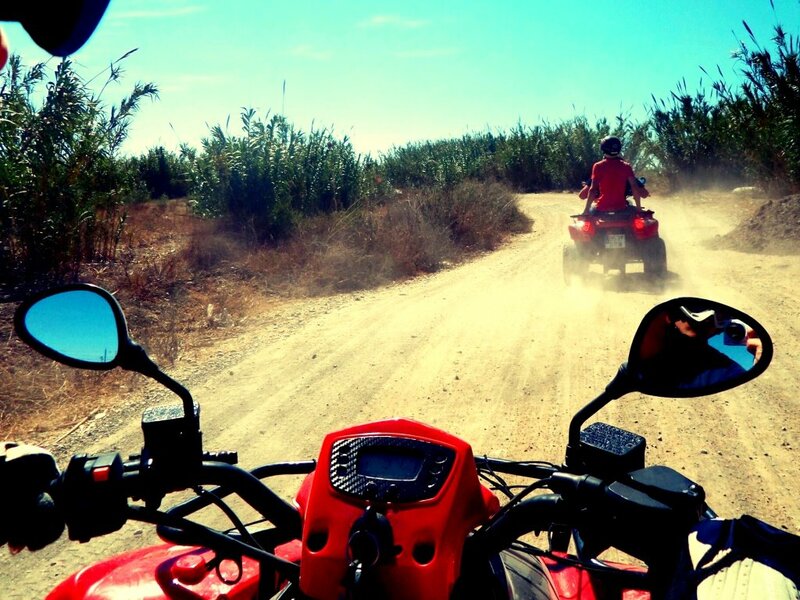 Enjoy the nature driving a Quad in Malaga! "Fuimos 3 personas y lo pasamos muy bien. Buena organización,recogida puntual y el guía simpático. Esta actividad es adecuada también para las personas..."
Monitors and expert Quad guides. Free pick up at Malaga Airport, Malaga Capital, Torremolinos, Benalmadena and Fuengirola. Ready to enjoy this fun and original activity? 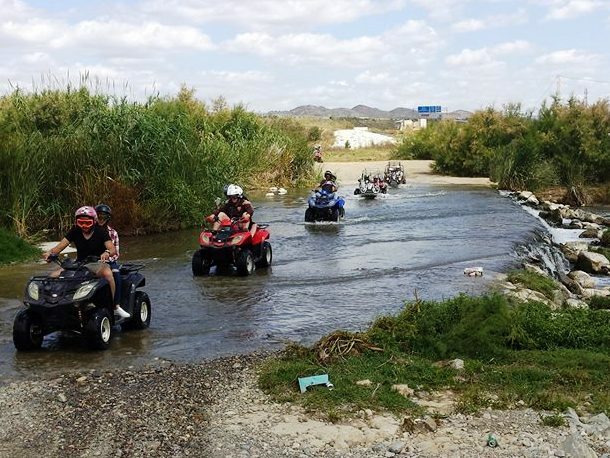 Experience this tour around the Guadalhorce River (Airport Area), where you can take a break and enjoy the surrounding countryside by driving a Quad! We offer you the possibility to live an authentic adventure, always with the greatest caution. This activity is destined to enjoy nature, not to run or take risks. Our goal is to enjoy with the highest safety and respect for the environment! To get used to driving a Quad, we will start on paved and straight paths. Afterward, we will continue along dirty roads, around the field next to Malaga airport, where we can stop to observe how planes take off and land from a perfect distance. 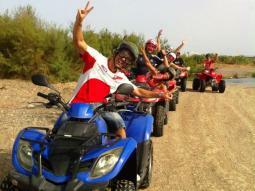 You will be always accompanied by a expert and professional Quads' guide in your group. In our tour you will see animals (horses, goats, sheep, great variety of birds, etc.). In the end, we will cross the Guadalhorce River, and we will get wet a little if it is hot, to take good pictures and take a break! Do not miss this opportunity to enjoy this fun activity in Malaga, book it now! We recommend comfortable clothes and sports shoes. (Flip-flops are forbidden). The driver must be over 18 years old and have a valid driving license. It is necessary to bring it, as it may be required during the tour! Children over 7 years old are allowed as companions, and always accompanied by an adult and legally responsible. 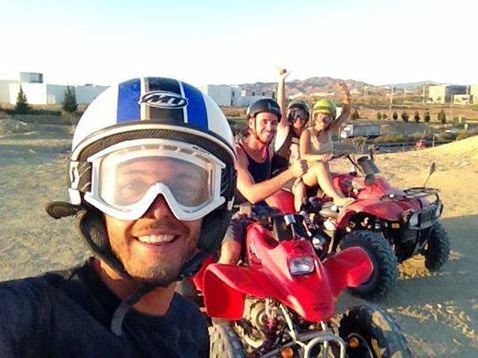 If you would like to enjoy this experience as Quad Passenger, you can go next to the driver for 20 euros. Remember this is not an extreme sport activity. We are looking for people willing to live an authentic adventure, always with the greatest caution, these walks are to observe nature. You must sign an agreement with the service provider prior to the completion of the activity. The service provider may ask you to change the shift during the day of the reservation. Quad Aventura Costa del Sol will notify you if there is no availability at the time that you selected and propose a different one. If you don't feel comfortable with any of the proposed times, you can cancel your booking at that moment indicating so to Quad Aventura Costa del Sol and obtain a full refund.